What are singular and plural? Singular and plural nouns and how they're taught in primary school, plus how KS1 and KS2 children learn about the formation of irregular plurals and how to use possessive apostrophes. A noun names an object, person or place. When a noun is singular, it means there is one of them. When a noun is plural it means there is more than one. 'Dog', 'balloon' and 'table' are singular nouns because there is only one of each of them. If these nouns were plural, it would mean there were more than one of them. An 's' would be added to the end of each word to make the words 'dogs', 'balloons' and 'tables'. To make most nouns plural we simply add -s.
There are exceptions, which children learn in primary school. 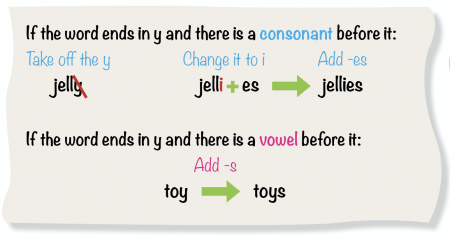 The new curriculum does not stipulate when these words must be learnt, but most children are introduced to spelling irregular plural endings in Year 3 and Year 4. A useful way to remember this is that if the word "hisses" or "buzzes", the plural has an -es on the end. Adding an apostrophe to a word does not make it plural: apple's does not mean more than one apple (that's apples)! Possessive apostrophes show that something belongs to someone or something. David's coat was on the back of the chair. To add a possessive apostrophe to a singular word that doesn't end in s we add 's. If a singular word ends in -ss we also add 's to add a possessive apostrophe (princess's room; boss's office). Children learn how to use possessive apostrophes for singular words in Year 2. Elephants' ears are large to help them cool down when they are hot. Children learn how to use possessive apostrophes for plural words in Years 3 and 4. How do teachers help children to learn about singular and plural? Children will use their understanding of singular and plural in grammar and spelling lessons throughout primary school. A teacher may explain a particular rule (for example, y changing to ies). They may then ask children to look in a dictionary for more nouns ending in y and change them to their plural form. Teachers may incorporate spelling rules into their classroom displays so children have constant reference to them when they are writing. Children may be asked to use the Look Cover Write Check technique to help them learn certain spellings (where a child looks at a word, covers it over, writes it from memory, then checks it). Cutting and sticking activities can help to make spellings clear for children (for example, cutting out the word 'calf' then the ending 'ves', cutting the letter f off and then sticking the 'cal' and 'ves' together on a page). Children's spellings will be corrected in their writing and they are usually encouraged to write the correct spellings out several times to learn them.